Candles can always create harmony, a wonderful atmosphere and bring peace into your home. Can you imagine your household without candles? Of course, you can’t! These lovely objects are especially indispensable at Christmas time. If you would like to make something unique or you don’t have any decoration ideas this year, you shouldn’t miss the following DIY candle holder projects! Nowadays candles are available in almost every shape, color, size or scent you wish for. But what about creating your own candle holders? I have good news for you: these ideas are absolutely special, need minimal effort and minimal cost. What’s more, you can even use your imagination, use different colors or materials. They can be perfect gifts for family members and friends. Last but not least, most of these designs take less than an hour to make. Let’s get started! Hopefully, you will find your favorite DIY candle holder project! This golden water lily design can perfectly fit your winter decoration as well. You can create beautiful things from simple plastic spoons. Just follow the steps in the pictures below and your handmade candle holder is ready. It will definitely bring some elegance to your home! Are you in love with modern designs and adore concrete crafts? Then this project is absolutely for you! It will create a ‘pure’ atmosphere in your home. You should know, that the procedure is simply, but you will need more time to get this beautiful result. (You should leave it to dry overnight.) Here you can find the step by step tutorial. To tell the truth, when I first glanced at this lovely DIY candle holder, I found it pretty difficult to do. But soon I realized that oh, there is no need to worry because actually, it’s simple! Firstly, what will you need? Firstly, lay the paper on a work surface and then place the doily, face down. After that apply the glue uniformly on the doily. Take your doily with care and attach it to the jar. Be creative, you can attach doilies as you like. For example, covering all jar, or just one part, it’s up to you! Finally, don’t forget to decorate the top of the jar with a lovely ribbon. Did you know that some gentle lace can create such intricate lines in concrete? You will need cement powder, paper cups to mix cement in, wooden sticks so you can easily stir cement mix, some coins, a disposable container, a smaller disposable container, sandpaper, and pliers. 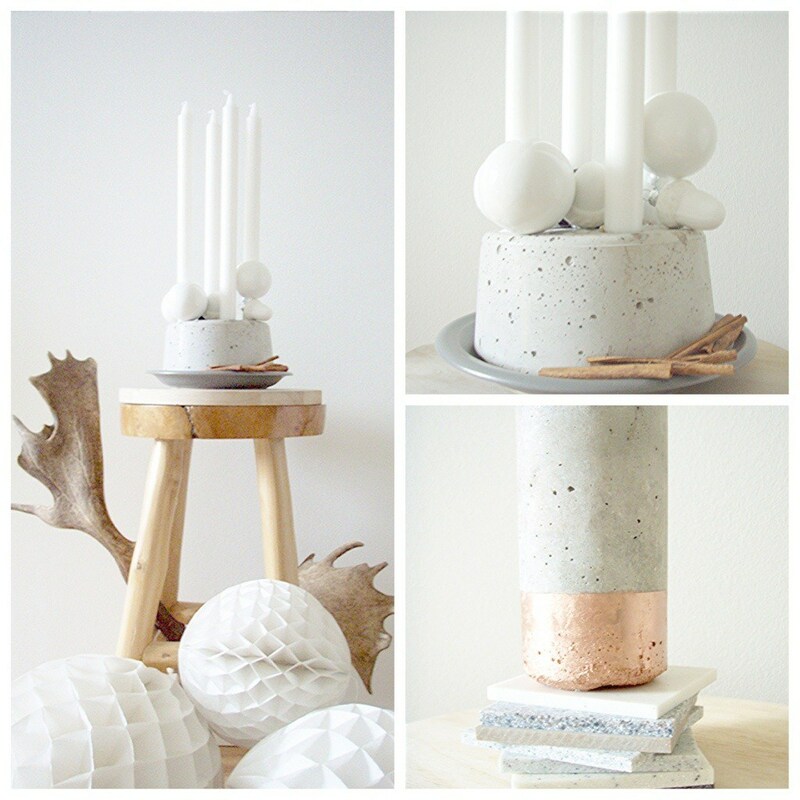 Don’t hesitate, to make this DIY-laced cement votive, just click here for more information and here you can also find the steps. As you can see, prisms and kaleidoscopes transform light into art. Isn’t it beautiful? You can easily make your own prism candle holder. What’s more, it can be a lot of fun if you do it together with your friends, or even with your little daughter! You will need a mason jar, round glass decorative elements, glue, ribbon, tea light, lighter and brushes. Let’s make your own candles, you can find the tutorial here. There is no doubt that handmade lace crafts are incredibly cool and awesome nowadays. Personally, I can’t get bored of them because they are so beautiful and look unique all the time. You will need old crochet doilies, a balloon, wallpaper glue, a tin candle, a nylon string and a needle. If you feel adventurous you can even use your own handmade crochet! Check out the steps now! Would you like to add the elegance of simplicity to your home? Well, then you shouldn’t miss this idea! You will need a glue, some doilies and any kind of decorations you like. Use your imagination and create something amazing! It’s so simple that you even don’t need to find out more about the steps. If you are fond of pure designs and simple, but unique shapes, you should try out this project! The square edges of the block contrast beautifully with the soft round lines of a candle. You will need a whittling block, white craft paint, paint brush, dot stickers and a 7/8″ drill bit (or one that matches the size of candles you will use). Explore the steps here. Check Out This Lovely Christmas Decoration Inspiration!